Ministry of Tourism Republic of Indonesia (MoT RI) and Emirates have signed an agreement to set up joint activities targeting an annual visitor growth of 20 per cent to Indonesia until 2019. Indonesia highlights its ambitious goals to reach 20 million international arrivals by 2019, in 10 beyond Bali destinations. It aims to work on simplified regulations for tourists, awards as incentives, and further plans for 2017. The tourism board has developed a digital market place called TXI, which stands for Tourism Exchange Indonesia. It will be integrated into the Ministry of Tourism website (www.indonesia.travel) and allow access to a wide range of real time tourism products such as packages and accommodation. Currently, 5,000 Indonesian suppliers are already registered at TXI. Also this year, Indonesian Tourism Board is developing 20,000 village homestays as a part of a programme to achieve 100,000 homestays by 2019. They will be built primarily in the ten priority destinations that have been identified across the Indonesian archipelago. The goal is to maximise benefits to local communities and diversify product offerings to visitors. Indonesia is also enhancing its air connectivity, aiming to increase the number of airlines flying to Indonesia, the destinations they fly to, and their schedule frequency. Existing airports are being improved and new airports are being built. From a statistical perspective, it is encouraging to review arrivals in Indonesia this past year. In 2016, there were 12 million foreign tourists who came to Indonesia, which was a 15.54 per cent increase over 2015. The arrival target for 2017 is 15 million visitors. The number of international tourists to Indonesia from January to February 2017 rose 11.19 per cent over the number in 2016, which raised from 1.54 million to 1.79 million visitors. The room occupancy rate of star-rated hotels in 27 provinces in January 2017 reached an average of 50.92 per cent, increase about 1.59 points compared to January 2016. 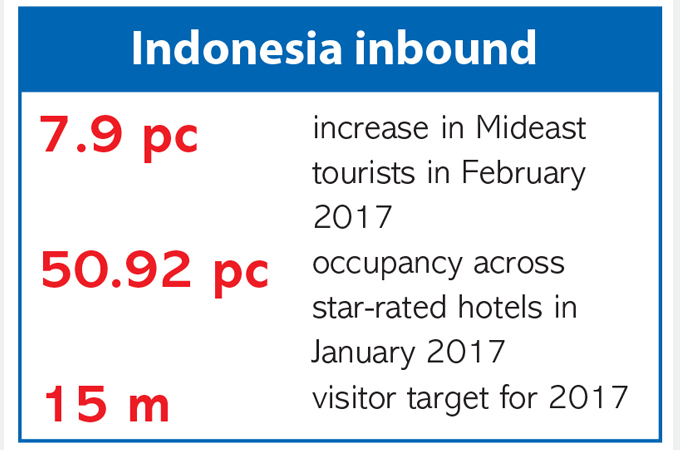 The average length of stay of foreigners and Indonesian at star-rated hotels in 27 provinces during January 2017 recorded at 1.94 days, an increase of 0.11 points compared to the state in January 2016. On the other hand, the number of Middle Eastern tourists visiting Indonesia from January to February 2017 reached up to 33,550, increased by 7.9 per cent compared to the same period in previous year with 30,981 visitors. Indonesia is targeting more tourists from Australia, China, India, Japan and South Korea, to boost state revenue amid continued low commodity prices. In addition to generating foreign exchange, tourism would help the country diversify its sources of economic growth, which is currently largely dependent on commodities. Indonesia, the world's largest crude palm oil and thermal coal exporter, has been severely affected by low commodity prices, and still recovering. Key to its strategy is to open new air routes for these countries, as well as upgrade airports and air navigation facilities. So, for 2017, these are the most important target markets. However, in our chat with Igde Pitana, deputy minister for international tourism marketing, it is evident that the Middle East will remain a focus area for Indonesia’s tourism sector for some time to come. “The number of Middle Eastern travellers to Indonesia reached 214,000 last year. This year we are targeting around 350,000 visitors – this is a 20 per cent increase on our figures from last year. In terms of percentage the number is still very small, but the expenditure of GCC guests is quite high. The average is $2,200 per person per visit, which lasts from 11 to 18 days. This is significantly higher than the global average, both in terms of overnights and tourist spend,” reveals Pitana. Foreign tourist arrivals in Indonesia numbered 11.52 million last year, a 10.7 per cent rise from a year earlier, according to data from the country's statistics agency, BPS. Indian tourist arrivals in Bali rose the biggest in percentage terms last year, by around 60 per cent to more than 150,000 people. Indian tourists ranked sixth in the number of tourists visiting Bali, after visitors from Australia, China, Japan, Britain and France. In the Middle East, Saudi Arabia stands as Indonesia’s most important feeder market at 80 per cent, but other countries in the GCC are showing a promising increase.